Sinclair Heating & Air Conditioning is a family owned business in Sampson County. David Sinclair is the owner, he is licensed in heating and air, electrical, and refrigeration. We specialize in HVAC sales and service. David started in the industry working with his father as a teenager, who owned Sinclair Heating and Air in the early 70’s. David’s experienced, licensed, and insured. Sinclair Heating & Air has been a presence in Sampson County for over 30 years. 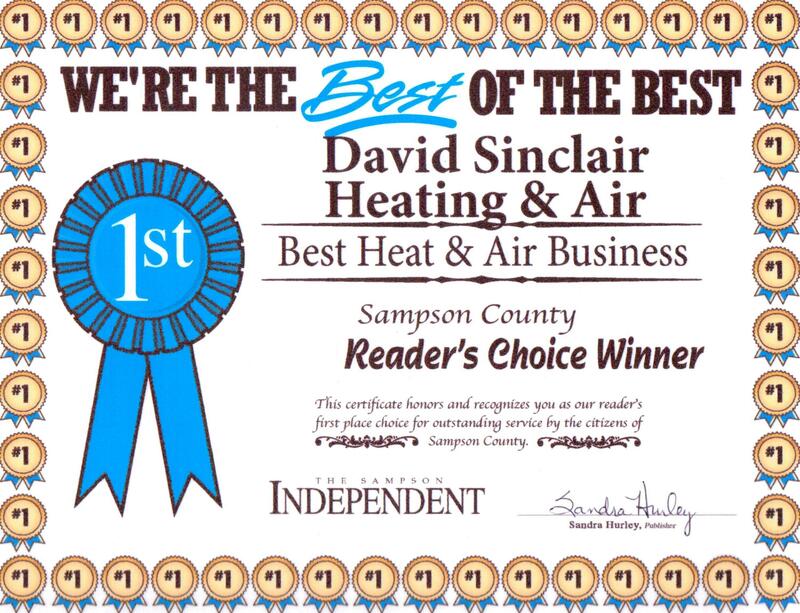 We’ve been selected as the "Best Heating & Air Company in Sampson County" thru The Sampson Independent survey for several years in a row. It is our goal to provide quality workmanship at the best price possible. We are authorized dealers for American Standard, and will give free quotes on new installs. We also service and repair all brands. Robert Dale is our manager, he prices all new installs and manages the install and repair crews. Robert is also licensed, and has been with the company for 20 years. Adam Sinclair, is David’s son and is in charge of the install crew. Adam makes sure units are installed to code, and that the work area is left clean when the job is finished. Cynthia Sinclair Naylor, is David’s sister and the office manager. She’s been with the company for 15 years. When you call the office, she makes sure to put you in touch with the right person for your needs. We would love to serve you in any of your HVAC needs, Give us a call if you need a repair, a new unit, or would just like to have your working unit serviced and tuned up. It would be a pleasure to get to know you. click the NC State Seal below.